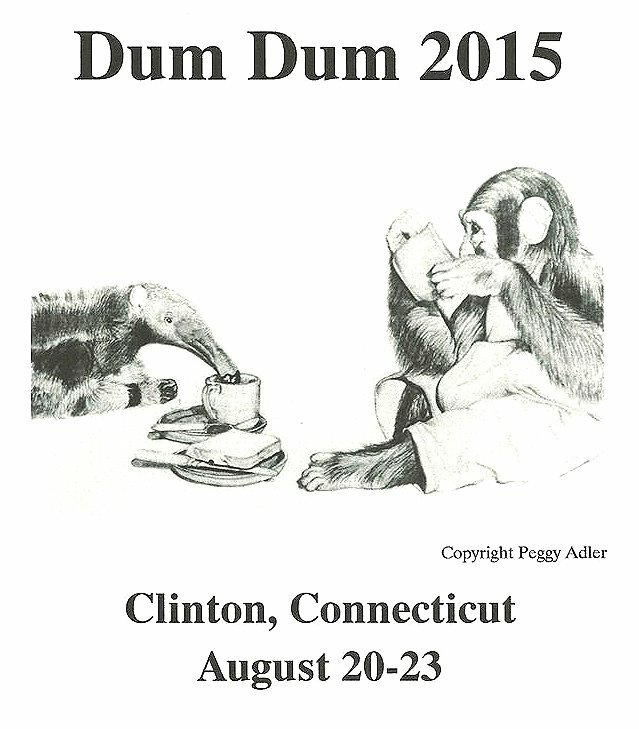 Updates from Peggy Come to Dum Dum 2015, August 20-23, at Andrew Memorial Town Hall in Clinton, Connecticut and meet the author and the illustrator of the first new Tarzan novel in years .... as well as members of the Burroughs family and the President of Edgar Rice Burroughs, Inc and his Executive Assistant.  Written by the prolific adventure writer, Will Murray (William Patrick Murray), author of "The Wild Adventures of Doc Savage" series, "Tarzan: Return to Pal-ul-don" is an authorized sequel to one of Edgar Rice Burroughs’ most celebrated Tarzan novels, "Tarzan the Terrible" and is published by Altus Press. 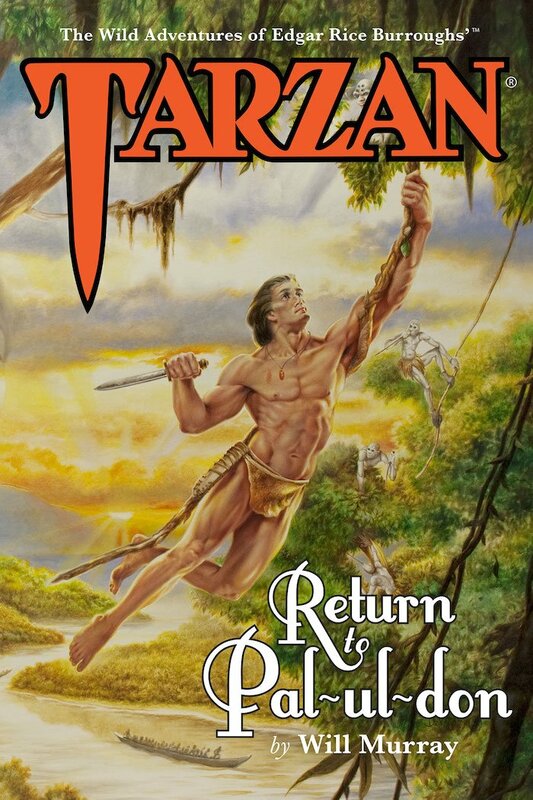 "Tarzan: Return to Pal-ul-don" features a magnificent cover illustration by award-winning artist Joe DeVito, who also executes the covers for Altus Press’ "Wild Adventures of Doc Savage" series. 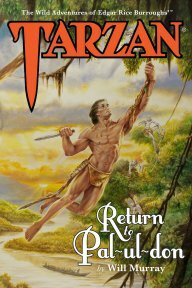 "Tarzan: Return to Pal-ul-don" will be released in paperback in June, to be followed by a deluxe hardcover edition with a wraparound cover. The deluxe edition will also contain a bonus Tarzan short story by Gary A. Buckingham, entitled “Tarzan and the Secret of Katanga” -- a sequel, which ties into the lead novel. Both will be available at Dum Dum 2015. Founded in 1923 by Edgar Rice Burroughs, as one of the first authors to incorporate himself, Edgar Rice Burroughs, Inc. holds numerous trademarks and the rights to all literary works of the author still protected by copyright, including stories of Tarzan of the Apes and John Carter of Mars. The company has overseen every adaptation of his literary works in film, television, radio, publishing, theatrical stage productions, licensing and merchandising. The company is still a very active enterprise and manages and licenses the vast archive of Mr. Burroughs’ literary works, fictional characters and corresponding artworks that have grown for over a century. The company continues to be owned by the Burroughs family and remains headquartered in Tarzana, California, the town named after the Tarzana Ranch Mr. Burroughs purchased there in 1918 which led to the town’s future development. Along with ERB,, Inc's President, Jim Sullos presence at Dum Dum 2015, there will be his Executive Assistant, Cathy Mann Wilbanks -- and three member of ERB's family: Linda Burroughs and her two daughters, Llana Jane Burroughs & Dejah Burroughs. Nancy will be vending Denny's books and DVDs. She'll also be contributing some of Denny's memorabilia for the auction. 9:00 am - 12:00 pm, Huckster Room open in the Green Room. picnic pavilion, with the food (Dutch Treat) from the beach's Hazy Daze concession. 3) Llana Jane Burroughs: Edgar Rice Burroughs’ Great-Granddaughter. 4) Dejah Burroughs: Edgar Rice Burroughs’ Great Granddaughter. *6) Jim Gerlach: Editor of the special new authorized BACK TO THE STONE AGE edition of ERB's classic novel - printed from the original G&D plates and with new art - will talk about Grosset & Dunlap and Edgar Rice Burroughs Past and Present. *8) Michael R. Hudson: publisher and book producer; owner of Sequential Pulp Comics and Raven's Head Press (http://sequentialpulpcomics.com/). 10:00am: Jim Gerlach will talk about Grosset & Dunlap and Edgar Rice Burroughs Past and Present. 11:00am: Alexander Simmons: "Tarzan, Love of a Darker Land"
ERB’s brothers, George and Henry (Harry) both went to Yale, graduating there in 1889 from the Sheffield Scientific School. Coincidentally, 189 years earlier, Yale was "born" in Clinton. 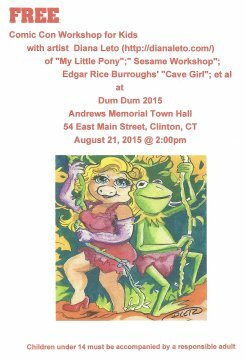 [The Dum Dum will be at Andrews Memorial Town Hall, August 20-23, and will be open to the public for free. 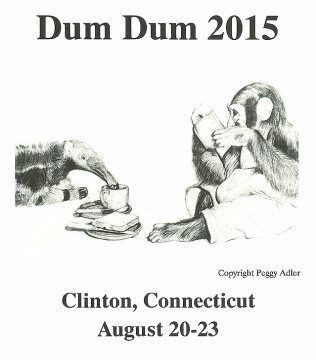 as well as on FaceBook at "Dum Dum 2015", as a page, a group and an event. Clinton, Connecticut is a mere 20 miles or so east of New Haven and is easily accessible by plane, train and car. Connecticut’s Bradley International Airport (BDL) services all major airlines, as well as bargain priced Southwest ( www.southwest.com ~ sign up for their e-mails); and Jet Blue (www.jetblue.com ~ sign up for their e-mails as well). Bradley is only 55 minutes from Clinton by car. Folks can also fly into New York’s JFK or LaGuardia; Rhode Island’s Warwick/Providence; or Boston’s Logan - and then rent a car or take an airport limo or train. Additionally, US Air flies into New Haven’s Tweed-NH Airport. Clinton is also accessible by Metro North, from New York City’s Grand Central Station to New Haven -- and then Shoreline East from New Haven to Clinton (or any of the other nearby shoreline stations); and Amtrak, which has stops in New Haven and nearby Old Saybrook. And of course, you can always get there by car -- to Exit 63 or 64 on I-95. What to do in the Clinton area: For folks who want to take side trips on their own: Since Clinton is only 20 or so miles from New Haven, they can go there to check out Yale; the Yale Center for British Art (http://britishart.yale.edu/) ; the Yale Art Gallery (http://artgallery.yale.edu/) and the Peabody Museum of Natural History (http://peabody.yale.edu/) (with its Pulitzer Prize winning dinosaur mural by my dear, late, friend Rudy Zallinger.) Or they may want to hop a commuter train to NYC for the day. Clinton is also near Mystic Seaport (http://www.mysticseaport.org/ ); Mystic Aquarium (http://www.mysticaquarium.org/); Essex Steam Train (www.essexsteamtrain.com/); Gillette Castle State Park, formerly the home of actor William Gillette, who portrayed Sherlock Holmes on the stage; Connecticut’s Dinosaur State Park and the Goodspeed Opera House (http://www.goodspeed.org) where “Annie” & “Man from La Mancha” started before going to Broadway. Additionally, for those that like to gamble – there are two, nearby, tribal run casinos (Foxwoods & the Mohegan Sun). Three miles West is the nationally acclaimed R.J.Julia Booksellers (http://www.rjjulia.com/). And the fabulous Book Barn @ Niantic is just a few miles to the East, off I-95 (http://www.bookbarnniantic.com/).